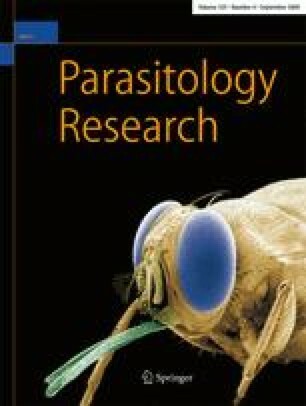 Since the integrity of Toxocara canis cuticle is essential for the nutritive and protective functions, light and scanning electron microscopic studies were undertaken to assess, for the first time, whether artemether had any effect on the cuticle including lips and sensory organs following 24 and 48 h incubation in vitro. The results were compared with those observed in the worm cuticle following incubation in albendazole, as it was 100% effective against adult nematode. The body cover changes seen after in vitro administration of artemether were similar to that induced by albendazole sulfoxide, active form, (ABZ-SO). However, the earlier onset of those changes was recorded with the former. The swollen appearance of the anterior end of T. canis, including the lips, distortion of some sensory papillae, and appearance of a number of lesions on the lips, were observed during in vitro action of artemether. Cuticular disruption had also been observed in adult T canis exposed to ABZ-SO. The surface changes were more severe than those observed following incubation in artemether, with which limited loss of the cuticle occurred in the lips of nematode but was not as widespread as that seen with ABZ-SO. However, the cuticular swelling of the anterior end of T canis was more pronounced than that with ABZ-SO. In the present study, artemether presented itself as a drug that might become important in nematode chemotherapy, besides its broad spectrum of activity against various trematodes.